Backpacking Mexico may not be something you’ve ever considered before. Like most people, my first visit to Cancun in Quintana Roo on the Yucatan peninsula meant a stay in one of the all-inclusive hotels lining the champagne Yucatan beaches of the popular Zona Hotelera (Hotel Zone). To be honest, there is absolutely nothing wrong with that! I had an unforgettably pampered week at my best friend’s wedding. However, a one-off day trip from the hotel to Tulum awakened something inside me. In a nutshell, Tulum inspired me to discover more about the real Yucatan peninsula beyond the big hotels. Wandering around the Mayan ruins of Tulum and admiring the breath-taking coastal location, I wondered whether this was the most beautiful place in Mexico. I promised myself that one day I would explore more of the Mexican Yucatan. So, a few years later, Oliver and I returned to explore the Yucatan, Mexico with a backpack of clothes. This is my experience of what is possible if you leave the confines of your hotel. In this post, we want to share with you some of the amazing things to do in Yucatan peninsula Mexico. The Yucatan Peninsula (Yucatán Peninsula or Peninsula de Yucatan) is a region found in Mexico in Central America. 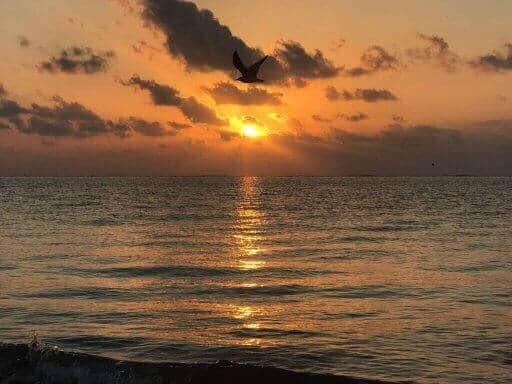 This Mexican peninsula is found in the southeastern part of the country and its coast projects into the Gulf of Mexico to the west and north and the Caribbean Sea to the east. Although many people refer to Mexico Yucatan, this region is in fact divided into 3 separate states, the most northerly of which is the Yucatan. The actual Yucatan Mexican states are Campeche, Quintana Roo and Yucatán. Each state has its own capital city. San Francisco de Campeche is the capital city of Campeche, Chetumal is the capital city of Quintana Roo (with Cancun as its largest city) and Merida is the capital city of Yucatan state.To the south of the state of Quintana Roo is Belize. The Yucatan peninsula is a relatively safe area of Mexico. We saw a lot of police on bikes, 4×4, helicopters and boats along the coast. The best advice for backpackers is to never travel during the night even inside a bus. 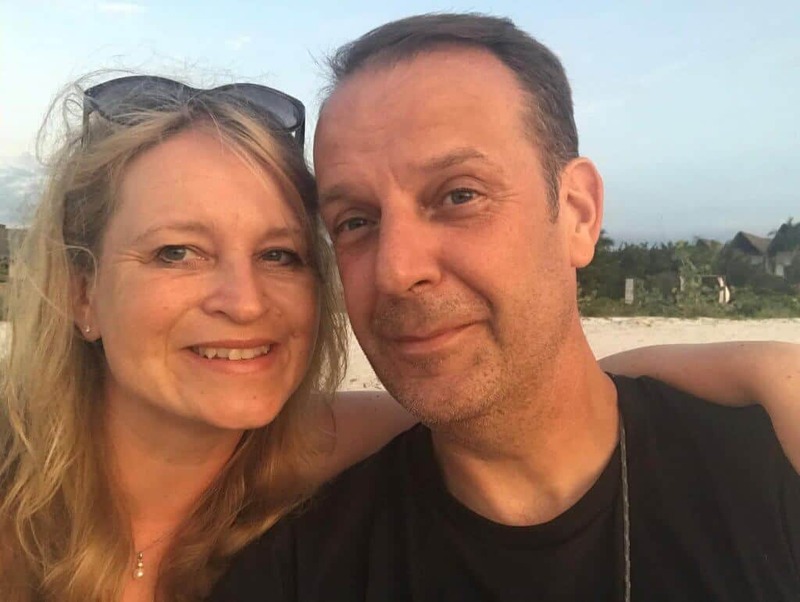 For full details of Mexico safety, particularly in the Yucatan peninsula, make sure you read our essential guide which is full of common sense advice. The Yucatan peninsula can be fairly cheap or very expensive depending on your travel choices. However, if you travel with local buses and avoid fancy restaurants, a budget of US$70 should be a good starting point. If you are interested in travelling more and spending less, check out this post and learn how to travel cheaply. It’s perhaps easier than you think! When planning our visit to the Yucatan peninsula, our first decision was whether or not to stay in Cancun overnight. 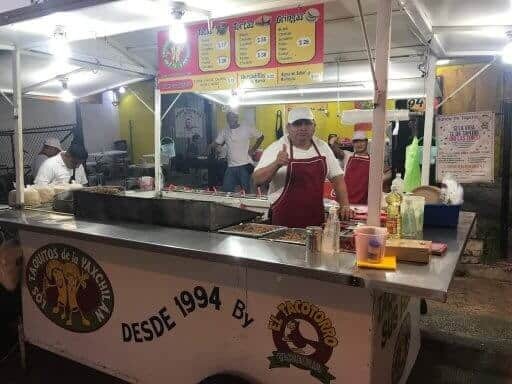 After a little research about the area, we realised that we were faced with a 30-minute bus ride north of the airport to downtown Cancun or a parallel journey south to the smaller town of Puerto Morelos. We opted for the latter and decided to stay at the beach area to make the most of our time here. To get to Puerto Morelos we took an ADO bus from Cancun International Airport. The bus will drop you outside the petrol station in the town centre which is a short taxi ride from the beach area. It is cheaper to stay where the bus drops you. Hotels and restaurants are less expensive here because they are away from the beach. If you decide to stay here, you will need to walk or take a taxi to the beach area. Some hotels offer bicycles. You can easily download the ADO bus app in advance of your travels and it really helped us make smart choices about our route choices. For two nights, we rented a small apartment near the beach in the small fishing village of Puerto Morelos. From our first chilled Margarita and a slow sunrise on the beach with coffee, we fell in love with this place. It’s a laid-back port with a wonky lighthouse right on the beach which seemed to stretch out forever in both directions. This Yucatan beach had a great vibe to it. At the southern end of the beach, you can sit and eat and drink in many restaurants and bars which spill out onto the beach. At night, it’s really romantic with soft lighting, no light pollution and a great atmosphere. If you’re interested in snorkelling or scuba diving, Puerto Morelos is part of the National Marine park. Off its shoreline lies the world’s 2nd largest barrier reef. For us, a chance short-cut to the beach led us to meet a French diving instructor and her crew. The next day, we headed out on a boat and completed our first two scuba dives on a PADI Discovery course. Destiny seemed to have led us to this place and we were completely captivated by Puerto Morelos’ crystal Caribbean waters. As we said above, if you are looking for the best price, you need to stay in the main part of Puerto Morelos where the ADO bus drops you. In this area you will find a lot of backpacking hotels and hostels for a very low price. On the other hand, there is nothing to do there and you will need to make your own way to the beach area where you can snorkel, dive or just enjoy the beach. When we were there, there was a festival on the beach with concerts and activities all day. A lot of locals had picnics on the beach and camped there overnight. Another benefit of staying in the town centre of Puerto Morelos is that you will find the restaurants were locals go. You will have a great food experience for half the price of the beach area. 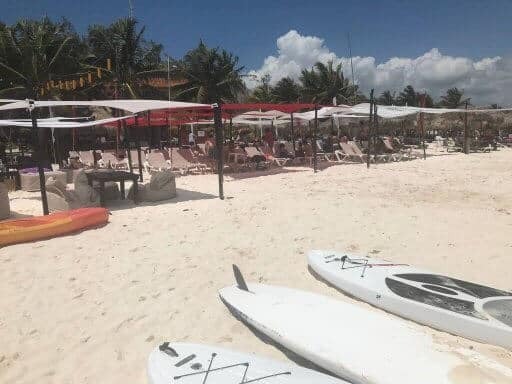 The benefit of staying in the beach area is that you don’t need to taxi each time and you are close to the water sports and life on the beach. We chose to stay in the beach area but we managed to find an apart-hotel where we could self-cater. It was very convenient to be able to wake up with a cup of tea and wander down to see the sunrise on the beach. Another advantage was that we could go back to the apart-hotel to have a shower and to relax with a book on the balcony. You will find very nice restaurants in this area where you can eat with a great view of the sea but, of course, it is more expensive than the town centre. Puerto Morelos is a developing resort. If you decide to stay in the beach area, you will find two small supermarkets where you can buy your daily provisions. We bought some kind of cheese but don’t know what type or where it came from. However, it was delicious. We also bought all the ingredients to make our own Margaritas for a fraction of the price of Margaritas in the restaurants. If you want to discover more about this charming coastal town, check out the best prices for places to stay in Puerto Morelos. After Cancun, Playa del Carmen is one of the more well-known and popular Yucatan cities. 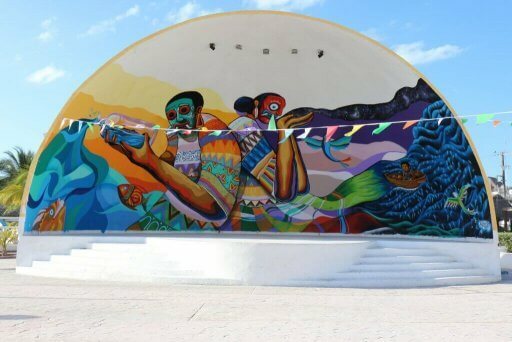 This much-hyped city is a popular destination in Quintana Roo. It’s about 20 minutes south of Puerto Morelos. To get there, we opted to travel with the local population in a Colectivo. Colectivos are air-conditioned mini-vans which only leave when they are full. They are a cheap means of transport, reliable and a great way to meet the locals. Playa del Carmen is a great place to shop and enjoy nightlife. You can shop in the many international stores found along the palm tree lined 5th Avenue. Here there are also plenty of trendy restaurants, bars and nightclubs if you want to party! If you want to shop for souvenirs and gifts, make sure you explore the streets beyond and parallel to 5th Avenue. Here we managed to find some interesting artisan shops. Whilst you are in Playa del Carmen, you could also explore the Frida Kahlo museum which displays many paintings from this famous Mexican artist. If you want to find the best beaches and clear water where you can enjoy snorkelling or diving, you can take a ferry to the nearby island of Cozumel or Isla Mujeres. We stayed in a boutique hotel in the centre of Playa del Carmen called La Pasion Colonial Hotel Boutique. This hotel had a perfect location very close to the bus terminal and close to all activities. It also had a fantastic rooftop swimming pool, jacuzzi and terrace which was a great way to relax after a day exploring Playa del Carmen. If you want the best prices in Playa del Carmen, you can check with Booking.com below. The easiest way to get to Xpu Ha Beach (pronounced Shpoo Ha ) is to use a colectivo from Playa del Carmen. This resort is a hidden oasis off Highway 307 often missed by tourists. 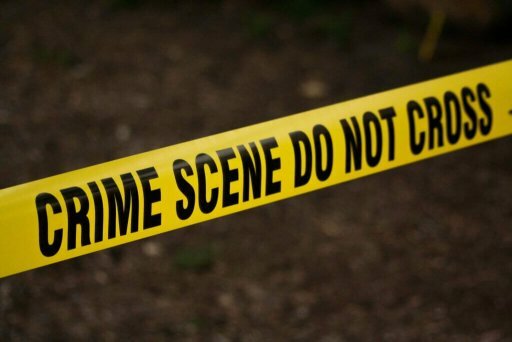 Our advice is to write down the name of your hotel and show it to the driver and they will stop nearby. We were dropped literally opposite the gates of our hotel and the fare was a mere 35 pesos each = approximately £1.50. Close to our hotel was the beautiful Xpu Ha beach. One of the perks of our hotel was a free shuttle transfer to a dedicated area of the Beach Club. However, the Beach Club is open to the public. You pay 50 pesos per person which is refunded when you spend over 200 pesos on food and drink. The turquoise sea is crystal clear and calm here. Perfect for an afternoon snorkelling and enjoying the sun. 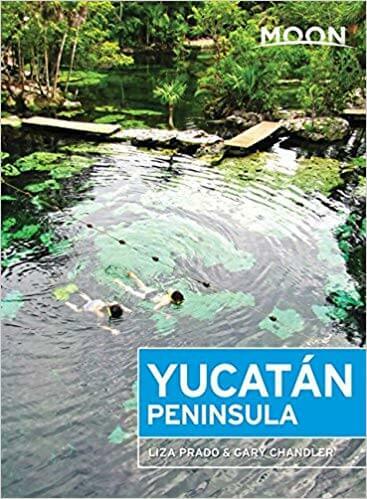 In the vicinity of Xpu Ha Beach, along Highway 307, there are also many cenotes which you can visit. Cenotes are deep, water-filled sinkholes in limestone which are scattered all over the Yucatan peninsula. It’s a fabulous experience swimming in a sinkhole! If you are feeling adventurous, further down Highway 307 you will find the all-inclusive Xel-Ha theme park where you can enjoy water activities and ecological attractions. For the best prices on Yucatan attractions, scroll down to the end of this post. There are many hotels along the Mayan Riviera near Xpu Ha Beach. We got a great deal on an all-inclusive resort close to Xpu Ha Beach called the Bel Air Resort & Spa. We booked in for two nights’ R & R in a treetop room with an enormous balcony, hammock and private jacuzzi behind the bed! Here we had our first experience of kayaking and swimming in the hotel’s private cenotes. To get to Tulum we flagged down another colectivo because this was such an easy, convenient and cheap method of transport. We loved that they literally drop you door to door. If the colectivos have places inside, they will flash their lights. Wave back if you want them to stop and pick you up! The main attraction in Tulum is the amazing ruins of this Mayan port. They are set high above the tantalising turquoise waters of the Caribbean Sea. Admire the many enormous iguanas who reside amongst the ruins too! It’s easy to spend a couple of hours wandering around and admiring the views. Visit early in the morning or late in the afternoon to avoid the crowds. It is also unforgivably hot and quite exposed here so take a sun hat and plenty of water. Tulum also has a fantastic beach where you can enjoy many water sports and activities. In the town, there are many restaurants and bars and large grocery stores. We stayed at a small guest house called Crucero Tulum which was 1,000 yards from the entrance to the Tulum ruins! This guest house also offered free bicycles to guests which were handy for visiting Tulum’s town centre and the supermarket (for aperitif and our evening meal). The guest house also offered a very reasonable laundry service by weight and served up a simple but nice breakfast in the morning. By mistake, we ended up in the local bus station in Tulum and took an ADO bus to Coba. Public buses serve the Yucatan peninsula really effectively and are comfortable and cheap. The bus dropped us close to the entrance of the Mayan ruins and the lagoon. We then had a short walk back to our guest house for the night. After a light lunch of prawn ceviche and tacos we set off on our visit to the Mayan ruins. The Mayan ruins at Coba are very different from Tulum. Take plenty of mosquito repellent as you are deep in the jungle. We also highly recommend that you hire a bicycle to explore the site. It’s exhilarating to whizz along the ancient Mayan roads known as sacbes and a good way to cool off. Unforgettably, Coba makes you feel like you are in an ‘Indian Jones’ movie. 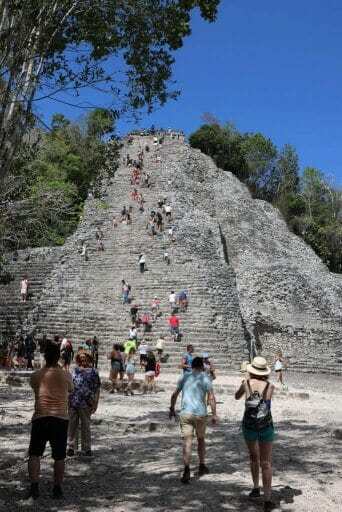 Climbing the 42 m high ancient pyramid of Nohoch Mul is a once in a lifetime experience. Get to the top of the 130 worn steps to see the amazing views across the jungle canopy. Don’t look back as you climb! Seize this opportunity as we can’t imagine the public will be able to climb this crumbling pyramid for much longer. Be aware that there are not many guest houses in this small village. Book ahead if you want to stay with the locals here. We chose to stay in the Hotel Sac Be which was a comfortable guest house above the local village shop which the owner also managed. The staff at the hotel were very friendly and welcoming and the food was freshly prepared in the small restaurant. It sounds obvious but the locals are the best way to help you find your way around a country. The owner of our guest house in Coba told us how to flag down the second-class Mayab bus from Coba to Valladolid. Valladolid was the missing piece in our transport puzzle for the final stages of our journey. 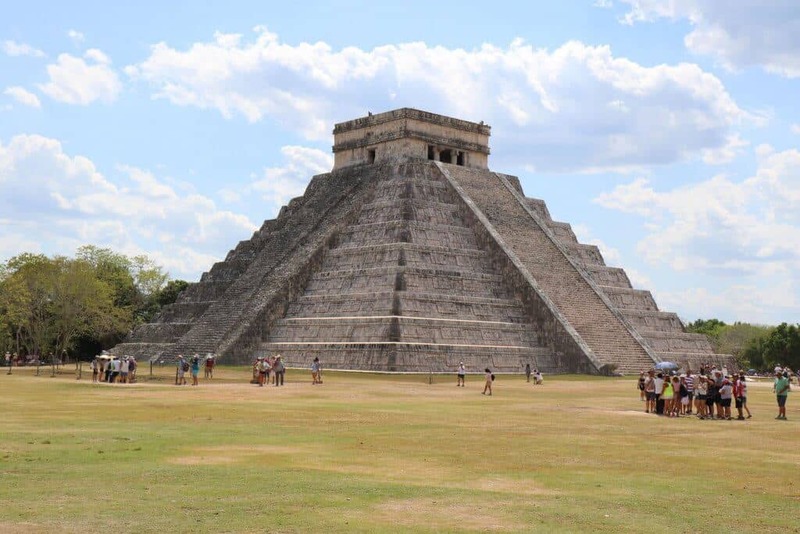 From Valladolid, we headed by ADO bus to Chichen Itza, one of the seven Wonders of the New World. Be aware that there are two entrances to Chichen Itza. Buses stop at the main tourist entrance where the car park is. Most hotels are on the other side of Chichen Itza, so you will need to take a fixed price taxi to your hotel if you arrive by bus. Despite the searing heat, the crowds and the abundance of artisan stalls jostling for your business, we weren’t disappointed by Chichen Itza. The site of Chichen Itza has been well preserved. The impressive El Castillo (The Castle) is 24 m high and represents the Mayan calendar. You can’t climb it owing to a fatality some years’ ago. The Great Ball Court is equally impressive. Marvel at the skill of the Mayan players and wonder at the winning captain’s reward of losing his head. If you are staying near Chichen Itza, make sure you visit the nearby cenote called Ik-Kil. There were many tourists here but is a beautiful cenote with hanging vines. We chose to stay at the Villas Arqueologicas which were located within walking distance of the back entrance of Chichen Itza. The hotel staff were very friendly and we had a welcome cocktail. The food in the pool-side restaurant was very good. Merida is the capital and largest city in the Yucatán state of Mexico. It’s situated in the north-west of the Yucatán peninsula and is easily reached by ADO bus from Valladolid in around 2h 20 minutes. We found Merida to be a very clean, safe and peaceful place. Sometimes referred to as ‘The White City’, Merida’s architecture is certainly a big part of its appeal, but we also found many beautiful pastel coloured buildings in addition to white colonial facades. This city was founded by the Spaniards back in 1542 on top of an ancient Maya city. As a result, it has many Catholic churches, colonial mansions and plazas which co-exist with strong Maya influences. Merida is not only the financial capital of the Yucatán but it’s also the cultural capital and has many museums and regular cultural events. To get an overview of some of the sights in Merida, we recommend that you take the free walking tour of the city offered by the local tourist office by heading to the ground floor of the Municipal Palace on the corner of Calle 61 and Calle 60. The tour starts at 09:30, lasts 90-minutes and is in Spanish and in English. Whilst you are in Merida, make sure you also check out the mansions on the Pasejo Montejo which is a wide tree-lined street inspired by the Champs-Élysées, the Plaza Grande and the San Ildefonso Cathedral (one of the oldest churches in the Americas), the Lucas de Galvez Market and some of the many museums, including the Gran Museo del Mundo Maya. If you haven’t explored any of the Maya ruins in the Yucatan peninsula, Merida is 75 miles east of Chichen Itza and Uxmal (a UNESCO-listed Maya ruin) is 1h 15 minutes to the south of Merida. We took an early morning colectivo from Piste (the nearest town to Chichen Itza). This returned us to Valladolid for our ADO bus journey to Chequila. Chequila is the tiny fishing port in the north of the Yucatan where ferries depart half-hourly to Holbox Island. 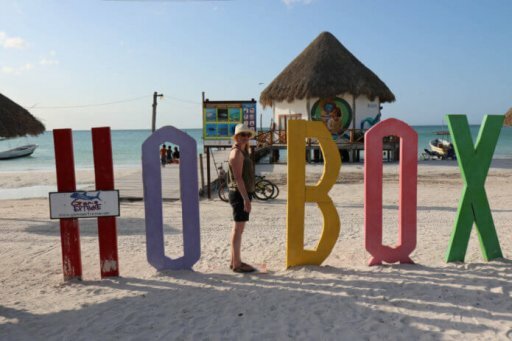 Click here for more detailed information on How to Get To Holbox Island. Holbox Island is just 26 miles (42 km) long and is a haven for many birds including flamingos. The appeal of Holbox is its tranquility. It is unspoiled by mass tourism and only golf-carts, taxi buggies and bicycles are permitted on the island. The streets of Holbox are formed of white sand and the beaches are uncrowded and retain their natural beauty. We spent an idyllic 5 nights on this peaceful piece of paradise and watched the most amazing sunsets. Olivier and I stayed at two different beach front hotels nestled in palm trees. We took advantage of seductive swimming pools and the mesmerising sea where the Caribbean meets the Gulf of Mexico. Hotel bicycles were perfect to explore the length and breadth of the island. At your own leisure, discover forgotten beaches filled with birds or laze around in hammocks idling in the sea. Drink at quiet bars with swing seats instead of stools or walk along deserted sand banks stretching to the horizon. Later, paddle in quiet estuaries teeming with fish. The main town has plenty of small restaurants and bars. It also boasts vivid panels of street art. At the weekend, the place comes alive when the locals visit from the mainland. Enjoy the freshly caught seafood on offer in Holbox. Dance on the sand under the stars with the local residents. We will never forget this place. We split our stay in two beach front hotels. Firstly, we stayed at the Villas HM Palapas del Mar which was a boutique hotel with 2 swimming pools. One was located on the roof and offered outstanding sunset views. Our second choice of hotel was Villas HM Paraiso del Mar next door. This hotel was more family-orientated but was still very peaceful. We tried to book direct with the second hotel, but the rates were a lot more expensive than those online at Booking.com. On top of that, with Booking.com we received complimentary bicycles during our stay. Check out the box below for best prices and special offers on this island. Regrettably, we had to stay in Downtown Cancun ready for our morning flight home. It’s a stark contrast to the chilled Holbox Island. We stayed near the bus station for obvious reasons. This meant we could visit both Mercado 28 (an Aladdin’s cave of tourist souvenirs) and Mercado 23. To be honest, the overall area was not nice. Mercado 28 is very touristic and you get hassled a lot. We got better prices at Mercado 23 as this is a shopping area for locals. The saving end to the day was great tacos from a friendly food truck in a side street! We had an amazing trip with our backpacks down the Mayan Riviera and around the Yucatan peninsula. Without doubt, this part of Mexico offers amazing historical experiences and the beaches are first-class. Just as we hoped, it is possible to travel far and spend relatively little by using local transport and staying in a range of reasonably priced hotels by doing a little research in advance. If you’ve never travelled by backpacking before, we hope you will follow in our footsteps. Check out some of our favourite backpacking gear and share where you go by commenting below. Click here to learn more about us and our travel philosophy. Mexico’s Yucatan Peninsula in 15 images Mexico’s Yucatan Peninsula in 15 images. This place was a great surprise for me. I was amazed by the crystal clear water and magnificent white sand. The Yucatan has the second largest reef in the world and we were lucky enough to enjoy it. Holbox Island, Mexico Holbox Island, Mexico In all honesty, I am torn about writing this blog post about Holbox Mexico. Part of me is desperate to share the simplicity and natural beauty we discovered on this idyllic island. The other part of me feels driven to protect this peaceful paradise. I love your trip and the extensive descriptions that you are providing here! The pictures are beautiful! I want to do this trip! It is one of the places that I want to visit with my partner. Thanks for your tips and recommendations. I would like to ask you how did you manage with the local currency? Did you exchange money in your country or did you exchange once you got there? And about the places that you were staying, can you send me the link or advise me where can I check to book hotel/rooms for convenient prices? Thank you so much for your advice, see you around! Thanks Christophe. Yucatan is very nice and the locals are very friendly. Sounds amazing! And very helpful! 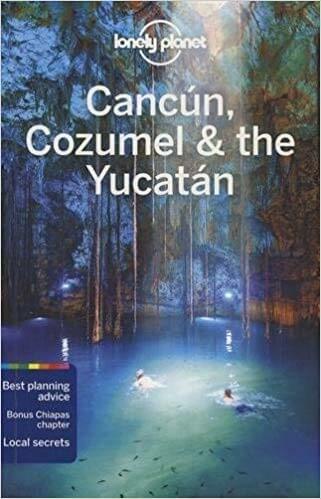 🙂 We’re backpacking in Yucatan in September and we took many tips. We are so glad you found the post helpful and enjoy your backpacking trip! It’s a fabulous place to explore and so easy to get around on public transport. We stayed at the Bel Air which we guess was a resort built quite early on in this area’s tourism development. It’s a bit tired looking, but we found a great deal and enjoyed our stay here. We wouldn’t recommend staying longer than one or 2 nights. The nearby beach is great. Have you checked out our posts on the Island of Holbox? Don’t miss out on a visit here.